The Fellowship was fortunate enough to obtain a copy of BLACKWOOD #1 from Dark Horse Comics. 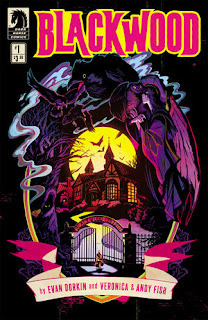 Evan Dorkin writes, Veronica Fish draws and colors, and Andy Fish letters and does the layouts. Welcome to Blackwood College. It’s your normal, creepy old college in a creepy old town. The new students are a diverse group, mostly kids who didn’t fit in, but the dean is a creepy old guy who clearly has no time for the newbies. When a weird dream wakes Wren and all of her roomies on the first night, and the dean wanders past them in the night, something very weird happens to the gang. Weirder than normal, that is. The dean is up to something, and it might be very, very bad. And weird, of course. This issue introduces us to a lot of characters (very efficiently, I must say) and hints very strongly at something supernatural. And I love how the art sets us up wonderfully for whatever might come along, with tons of hints about dark, twisted elements in several of the characters. This is a story opening that, like Blackwood itself, is packed full of interesting little tidbits and hints at what might be on the way. It’s a great start, and I look forward to seeing where it goes and how it gets there. BLACKWOOD #1 is available now from your local comic shop, or online at darkhorse.com.